28th October, London: Canonical today announces the availability of the Canonical Distribution of Ubuntu OpenStack, which fully automates the creation of a reference OpenStack cloud from bare metal, building a fully managed private cloud in minutes. Based on Canonical’s industry-leading OpenStack reference architecture and building on Ubuntu’s leading position as the most widely used OpenStack platform, the Canonical Distribution gives users the widest range of commercially-supported vendor options for storage, software-defined networking and hypervisor from Canonical and its OpenStack partners. It then automates the creation and management of a reference OpenStack based on those choices. The Canonical Distribution starts with the industry-leading MAAS for physical hardware detection and provisioning, and Canonical’s Landscape for systems management. Adding machines to MAAS is a simple network boot, after which they can be allocated to Landscape for use in the cloud. MAAS supports the labelling of machines into physical isolation zones for high availability, and Landscape will eventually ensure the high availability of the cloud if it has sufficient hardware in multiple zones. 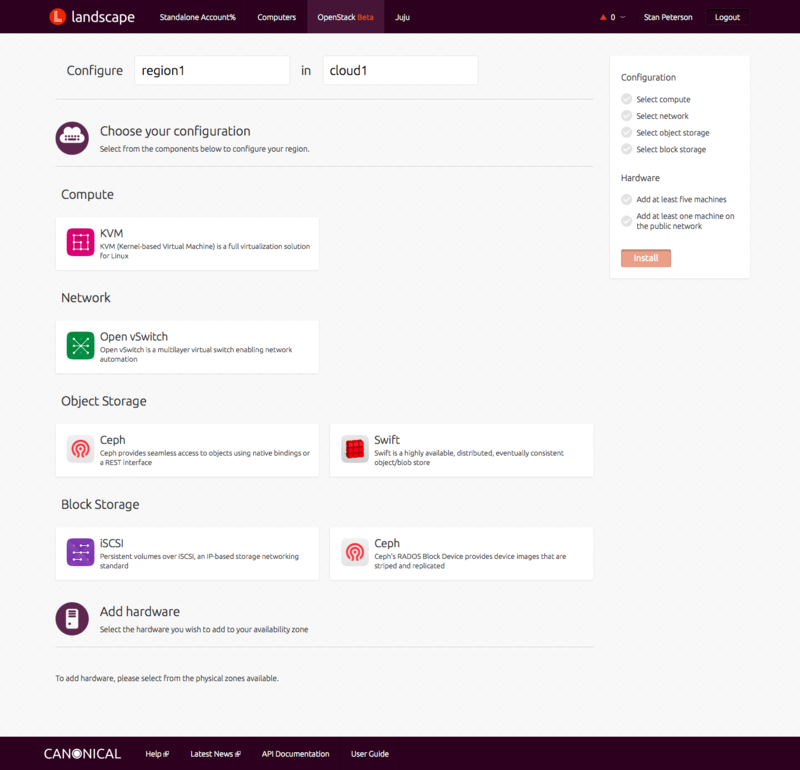 The Canonical Distribution includes a simple web-based UI in Landscape, which enables customers to choose the components they would like for their cloud, and only presents options that are compatible with existing infrastructure. Once the cloud is built, Landscape offers OpenStack-aware monitoring that tracks the health of running cloud environments and the continued availability of compute, storage and network resources. It also contributes to capacity planning with real-time predictions based on current utilisation trends, helping determine when it will be time to add new compute nodes or additional storage. The Canonical Distribution of Ubuntu OpenStack supports a range of vendor components for network, storage and compute, based on real-world interoperability testing at Canonical’s OpenStack Interoperability Lab (OIL), which on a continuous basis tests thousands of configurations of Ubuntu OpenStack built with third party hardware and software. As more solutions are proven in OIL they can be included as additional options in the Canonical Distribution of Ubuntu OpenStack, giving customers even wider flexibility in their choice of cloud components. The Canonical Distribution helps enterprises realise the cost savings of private cloud by reducing the time spent on consulting, architecture, dedicated staff hours and operational processes for those cloud environments, concentrating valuable developer time on business tasks and workloads. “Private clouds will only be economically beneficial if they are as easy to deploy, manage and scale as Ubuntu itself, and with the Canonical Distribution of Ubuntu OpenStack we have set a new standard in automation for OpenStack. We look forward to working with more vendors to support their OpenStack components, and are delighted with the feedback from private beta customers on the distribution to date” says Jane Silber, CEO of Canonical. 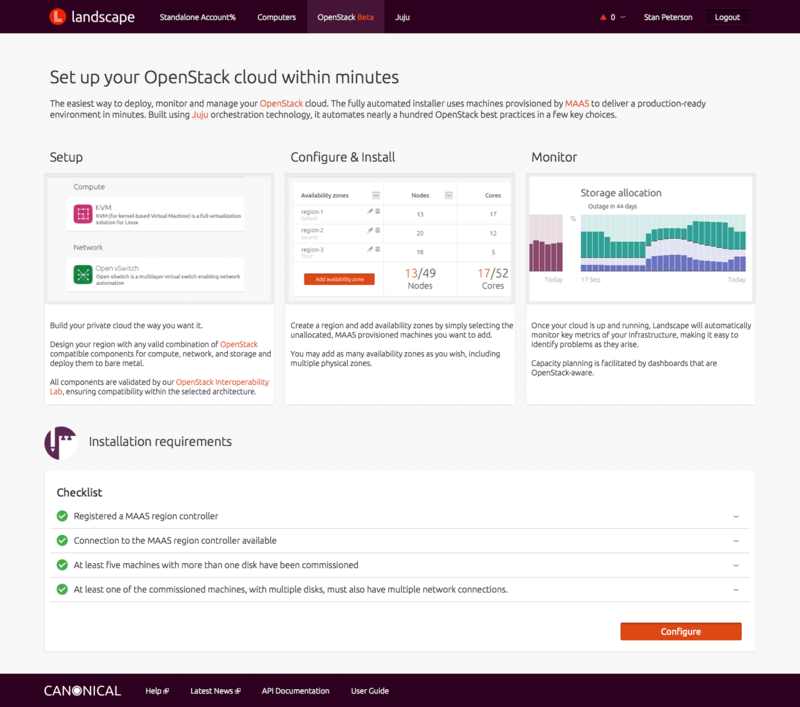 The Canonical Distribution of Ubuntu OpenStack is now available as a public beta, free for up to 10 physical and 10 virtual machines.